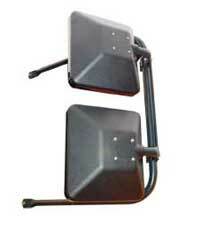 Rear view mirrors come in several styles and configurations. The best of them provide great views down the sides and to the rear of the vehicle and can extend several lanes across traffic. From the hand-adjustable to the remote-controlled, Mirror Lite's unique line of rear view mirror systems allows you to exceed the specific requirements of any bus. Highly Servicable Mirror Systems - Faster, Easier, Safer! Long Service Life - Durability for the "20 Year Bus"